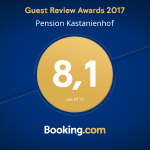 The quiet family owned Kastanienhof is located close to the center of the lovely town and only a few minutes away from the beach. At the edge of the UNESCO-bio-reserve, you will find this island oasis of relaxation and recovery in a dreamlike idyllic spot. In an atmosphere filled with hospitality you will soon forget all the stresses of your everyday life. Treat yourself to a relaxing vacation in this perfect example of a classic German vacation home. Comfortable, authentic vacation apartments up to 5 people are equipped with TV, radio, and kitchen. They offer large open balconies\ terraces to the southwest mostly with garden view. A free parking lot is on the property, so is a barbeque pit and a nice lawn for sunbathing. Breakfast only in the off season.